Are you still working on checking off your gift-giving list this holiday? You’re not alone! To make things a little easier for you, we have an easy gift idea that will make both kids AND grown-ups happy. All the new school and art supplies from back-to-school are probably lost/dried up/broken by now, so it’s the perfect time to give the gift of color to the kids and the kids-at-heart on your list. Check out these two limited edition gift packs I found at Target! 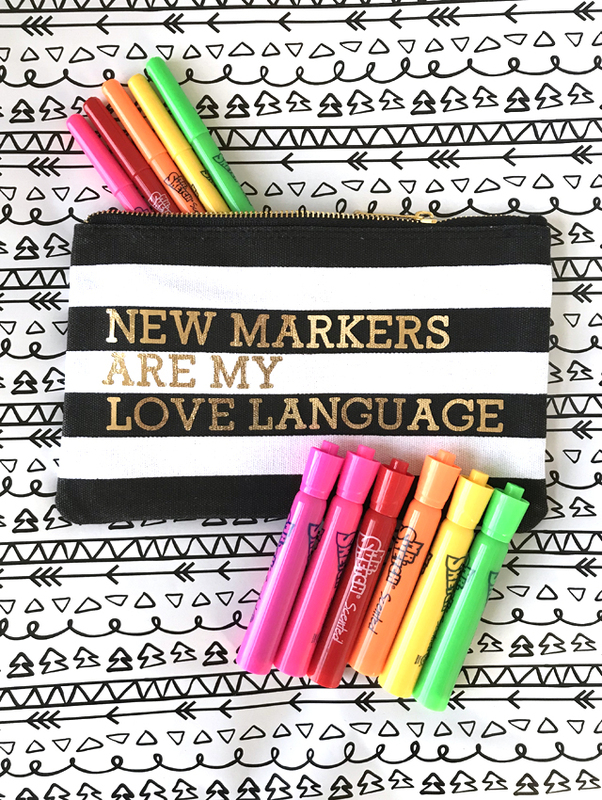 The Sharpie Permanent Markers Limited Edition Gift Pack has over 30 markers in gorgeous colors and is going to be the perfect gift for our super-artistic sister in college. I already know my art-obsessed daughter is going squeal when she opens the Mr. Sketch Scented Combo Gift Pack we’re putting under the tree for her! The gift sets alone are great, but I love adding a personal touch to store-bought gifts to make them more meaningful. 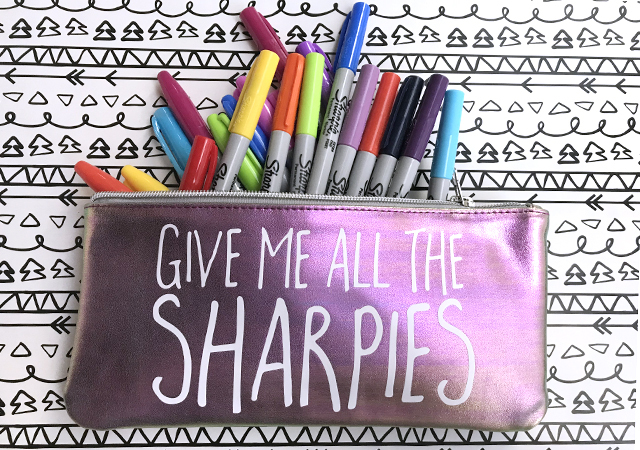 Zippered pencil pouches or small makeup bags are perfect for keeping all that color contained and easy to take on the go! We added a funny quote to make this a special gift. Measure the pouch or bag you will be personalizing. Use your computer/electronic cutter to cut a name or one of the fun quotes we used. Make sure to “mirror” your image before cutting. Always follow your specific machine’s directions. Iron vinyl on to pouch using the settings listed on your vinyl’s instructions. For more heat-sensitive fabrics (like the metallic pouch) I always use a pillowcase or thin dishcloth while ironing. Peel back the transfer sheet after it cools. It’s ready to gift! 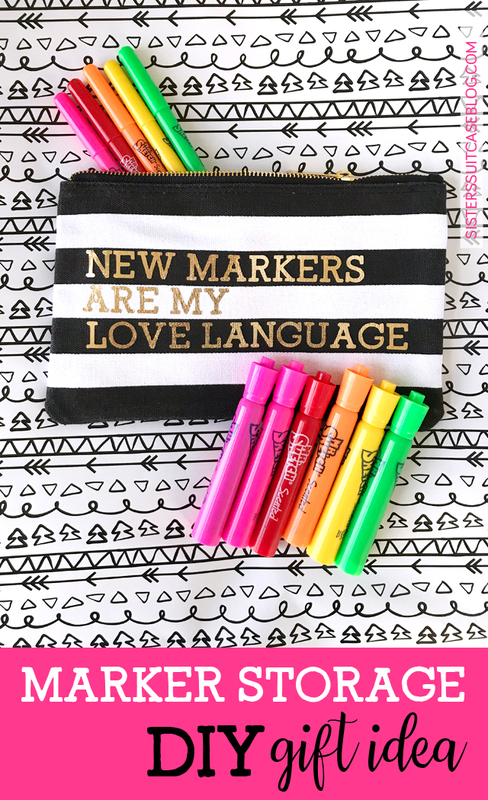 This fun and functional gift is great for teachers, your hand-lettering pro friend, moms and dads (to label all the STUFF, of course), or your older child who loves to create! 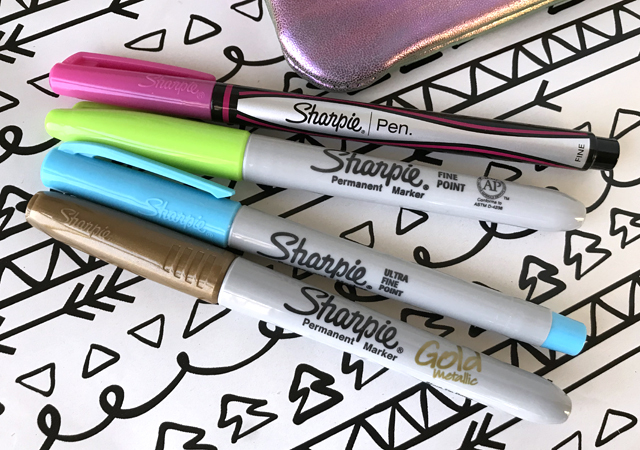 The Sharpie Gift Pack includes Fine Point, Ultra Fine Pint and Metallic Markers PLUS Sharpie Pens! I just discovered those and I am obsessed! For the younger kids, grab the Mr. Sketch gift set! Yes, they smell like the ones you grew up with and totally bring back all the elementary school feels. I seriously can’t wait to give these to my daughter – she is going to love them! She’s getting this zippered bag I made using the same tutorial, with metallic gold vinyl. We must be related because we both share this love language! 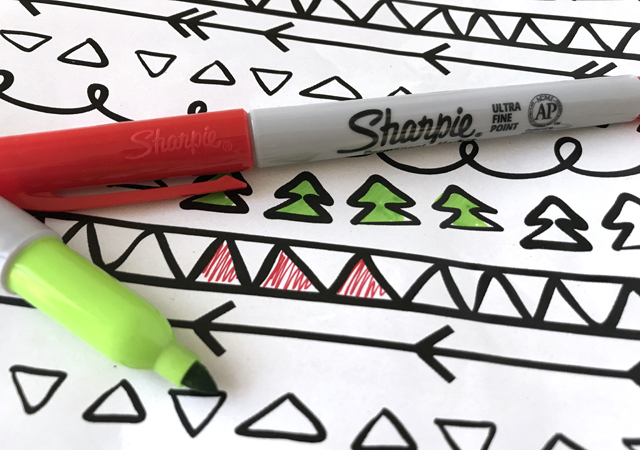 Both of these gift sets come with coloring pages so those markers can be used right away… but you can also wrap your gift with black-and-white patterned paper to add to the coloring fun! What creative gifts are you giving or hoping to get this year? We would love to hear your ideas!